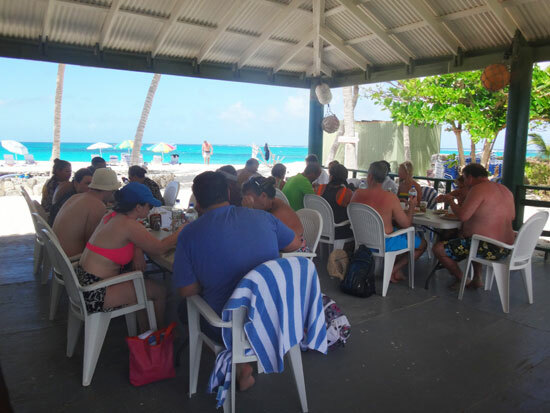 It is common knowledge to Anguilla regulars for many years now, that Johnno's Beachfront Restaurant is the perfect place to combine all of the things that are wonderful about the island: the beach, the people and the food. 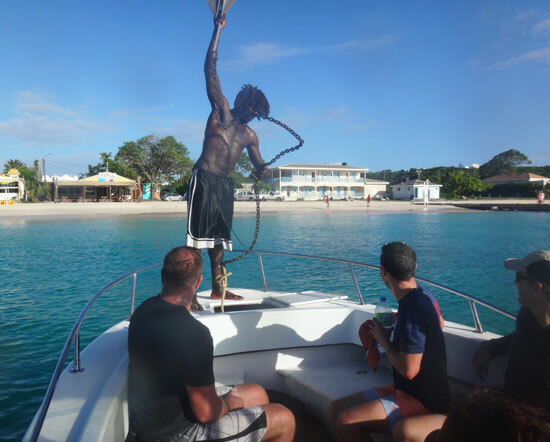 Therefore I was especially happy to learn that there is another option for absorbing that special Johnno's style of food and hospitality - and this option includes a boat ride to…. 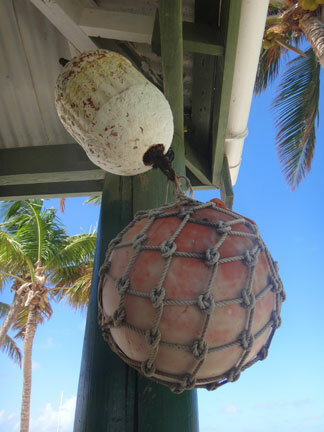 Anguilla's offshore cay called Prickly Pear! Welcome to Johnno's at Prickly Pear! 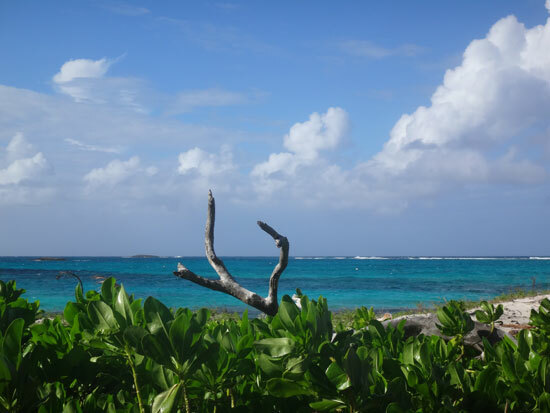 I had only experienced Prickly Pear (a pair of uninhabited cays which are a protected marine park) once, through the Anguilla National Trust for a hike and bird observation trip. But, on a breezy day in late November, I caught a ride to Prickly Pear with the one and only, Captain Johnno and his crew. I was in for a day of relaxation, a few Corona's, good conversation and very good eating. I was also ready to take this quick and unique trip once more but this time, from a vacationer's perspective! I arrived to the Johnno's Sandy Ground restaurant location just before 9am. The crew had already started getting the coolers ready to load on the boat. Johnno greeted the guests and asked for their food orders (I'll list the menu further down on this page). The passengers loaded first and on this particular day, rode in the front of the boat "Sandy Deep". 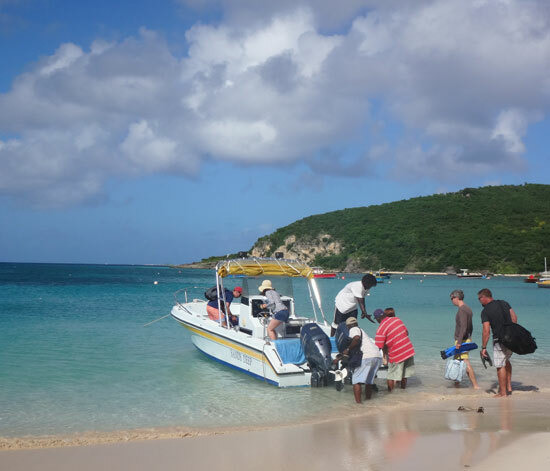 Note: After all are aboard and the boat departs Sandy Ground for Prickly Pear, it's roughly a 20 minute ride which has you never losing sight of mainland Anguilla and even St. Martin. It was a windier, choppier day so Johnno took his time to ensure a safe and smooth as possible ride. Tip: As a passenger, be prepared for the possibility of some sea spray or not… it will depend on the sea the day of your trip. I recommend traveling in your bathing suit, especially if you plan to get in the sea during the day and also because you enter and exit the boat via the beach. Just to be safe, I also recommend putting any non-waterproof contraptions in the boat's cubbies once you board. I found the crew to be top-notch at making sure your items are cared for. On this day we had some spray from time to time which I found to enhance the experience - after all, it is a boat ride in the Caribbean! The ride takes you out of Sandy Ground and towards the west-northwest, whisks you past Sandy Island and over and up to Prickly Pear. You're able to see as far east as Little Bay on Anguilla and all the way over to St. Martin to the south. Look around, watch the water and enjoy the ride. It can feel nice to have the sea air in your lungs. 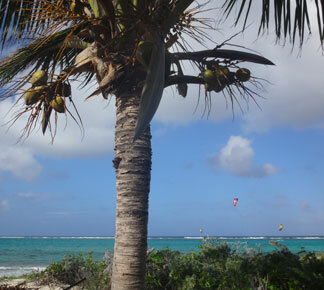 The ride is rejuvenating and your sea arrival to Prickly Pear is breathtaking. See the picture at the beginning of this page for reference - amazing, even when windy! Then once you begin to absorb the reality of where you'll be spending your day, you are moved again by the sheer thought. I've found that traveling from an amazing island, via boat and to an outer, uninhabited island feels quite like a vacation on top of a vacation. You are virtually forced to relax, if you know what I mean. It's not a bad thing! 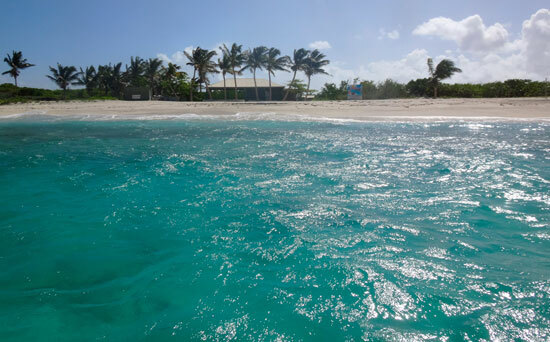 This grand entry I speak of is on Prickly Pear's eastern cay (where Johnno's Prickly Pear is located) which has a beach on the northern side and is therefore more accessible by boat and is excellent for hiking about and exploring, taking in the uplifting scenery. Prickly Pear is elemental. A rare treat! Authentic nautical decor... an appropriate touch! Just off of this beach area is magnificent snorkeling. It's also the area where you'll find the only buildings on the island which are a couple of covered areas and restrooms. 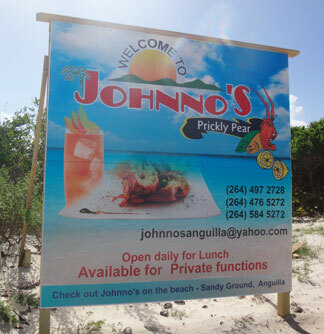 One of those areas, and thoughtfully blending in to the natural beauty of the island, is Johnno's Prickly Pear location. 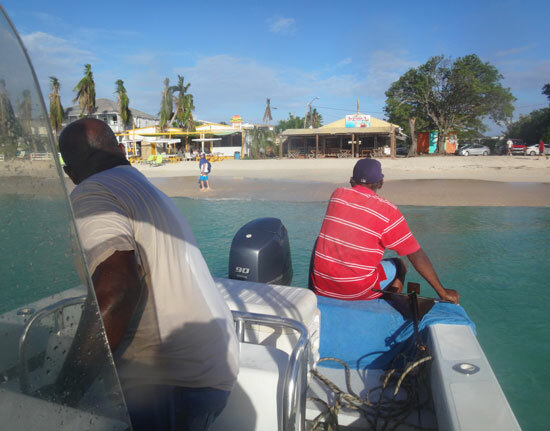 After anchoring at Prickly Pear, the crew safely assists the passengers off of the boat. It's a short walk in the sand to the shelter and your home base for the day. 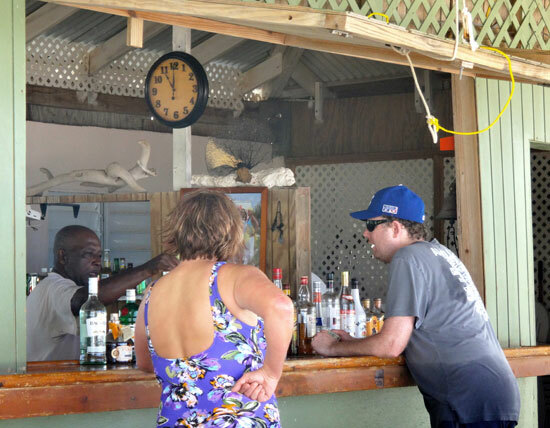 Roofed, open air and painted a tasteful sage green, Johnno's is easy going and provides a straight-shot view of the beach and sea through coconut palm trees. The minimal, authentic nautical decor was on par as well. 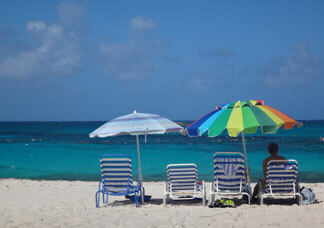 The crew is happy to set up your beach chair and umbrella if you like. Now's a good time to have a cold drink from the bar as well. Depending on the day you are there, visting boats begin to arrive and anchor. Some stay for the day, some come and go. The day I was there, the guests took off immediately to snorkel (gear is provided if you haven't brought your own). Johnno had alerted them to the possibility that they would have it more to themselves in the morning and before the charter boats arrive with more eager snorkelers. Mind you, there's still plenty of sea space for all that are interested at any point of the day. Lounge, snorkel, or do both while you're at PP! If snorkeling isn't of interest to you, there is still plenty of entertainment by design or by default. Johnno plays soothing jazz music over his crisp speaker system. You can take a beach walk, go for a swim, lounge and read a book, take a nap, work on your suntan or chat with the charismatic crew. I met a couple of ladies who were smitten with the bananaquits or "sugarbirds" that are found on Prickly Pear and spent some time observing them as well. As the saying goes, "time flies when you are having fun", because before you know it - lunch is served. After arrival the crew got busy on the grill and in the kitchen cooking up some of the best and freshest food you can find in Anguilla. 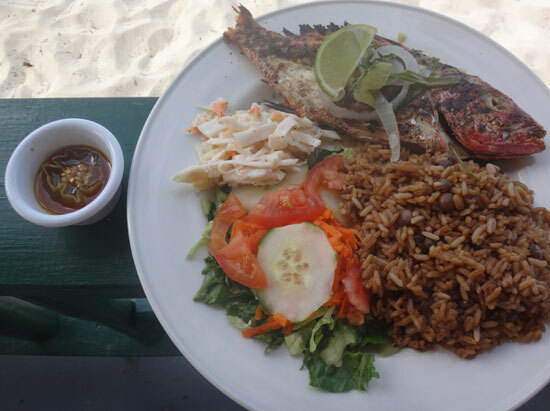 Johnno and Renaldo did the cooking and was I ever thankful for that… I had the grilled whole snapper and the plate came with rice and peas (a staple dish in Anguilla), crispy, sweet cole slaw and a fresh and cool green salad and it tasted like a reward. The Grilled Whole Snapper lunch - divine! I was already a big fan of Johnno's steamed whole snapper. To taste his grilled whole snapper was a treat too - cooked perfectly and full of flavor. What I didn't expect was to have the best rice and peas I think I've ever had! It was a large serving and I still was wanting for more based on taste alone. I also sampled the notorious Johnno's hot sauce. It looks like more of a pepper-infused oil than a sauce. It has a great flavor if you can take the heat. Although, it wasn't necessary to add anything to this meal unless you just wanted the flavor variation and like things hot! The meal was perfect and on order with the events of the day. Entrees include: Lobster, Grilled Whole Snapper, Grilled Fillet Snapper, Shrimp Scampi or Grilled Shrimp, Stewed Conch, Grilled Chicken, Grilled Ribs and a Chicken & Rib Combo. There is a Vegetable Platter too. Prices for the entrees start at $20 US with most of them running $20 to $25. The highest end of the menu is the lobster which starts at $42 US. The entrees are served with 3 sides - "a choice of peas n rice, chips, coleslaw, and salad". Note: the chips are french fries and not potato chips. You can order the sides a la carte as well, they are $5 US each. 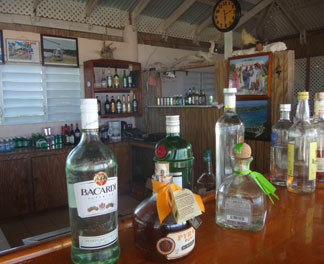 Anguilla dining history, so have a closer look. If this excursion of sounds like something for you'd like to do, speak with Johnno's in advance to pay one more inclusive price for your food and boat ride. Your beach chair, umbrella and snorkel gear along with one cocktail will be complimentary. Weather permitting, the crew from Johnno's is able to host you at Prickly Pear on Wednesdays and Sundays. Let Johnno's know what day you are interested in if those two don't work for you (phone number at the bottom of this page). It's great to have no agenda on Prickly Pear. 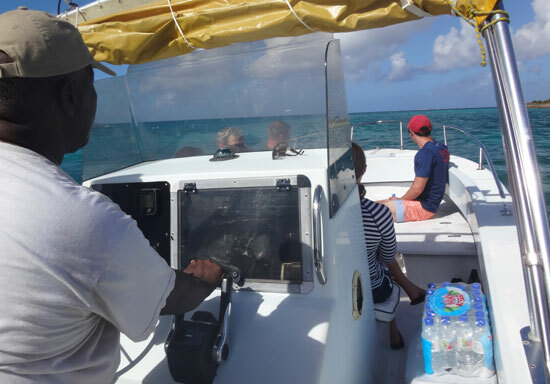 The day I was there I spoke with visitors to Prickly Pear who were on the Eagle Tours, Quality Time - a racing boat out of St. Maarten. Their hostess for the day was telling me how much she and her guests had loved coming to Johnno's at Prickly Pear over the years. It was pleasing to hear and reinforced my thoughts. I met some nice people that day, just enough for a some small invigorating conversation to make me feel appeased. I did leave some time to wander alone and be reflective too. The beach is easily walkable and naturally gorgeous. If you bring some sturdier shoes you can more easily go further in to the island, over rocks and through some brush to get a better look too. Once you are ready to rest your body, the loungers are comfortable as can be and the breeze and sound of the ocean can help put you in napping state if you allow it. Later in the day when I was there, some kitesurfers seemed to appear out of nowhere and were offshore taking advantage of the windy day. It was entertaining to watch as I sipped my cold Corona. They were still at it when we departed Prickly Pear for Sandy Ground. Sounds like a sweet day, right? It truly is. During the boat ride back, the sun shone in a single ray through a huge puffy cluster of clouds. Sunset was getting nearing but we were back in Sandy Ground with plenty of daylight. Just a simply as we had boarded the boat, we unloaded on to Sandy Ground right there in front of Johnno's Original Beachfront Restaurant. The guests then settled up with Johnno's and said goodbyes until next time. 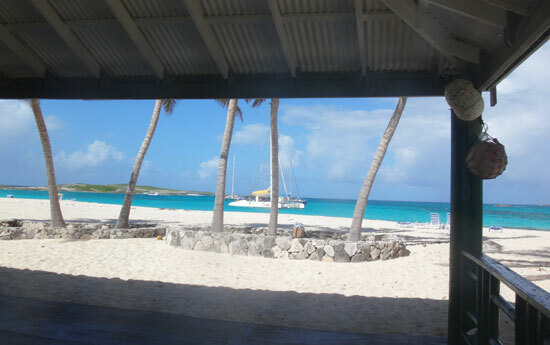 And there is a next time for many, as Johnno's and the island of Anguilla tend to keep people coming back for more. Johnno's Prickly Pear can provide you and yours with a boat ride to and from Prickly Pear either on the excursion's signature boat, the "PP Express" which allows for up to 12 people or on another reputable motor boat. You'll meet at Johnno's in Sandy Ground and depart in the morning alongside the crew and return in the afternoon when the crew returns (roughly 9am to 4pm). 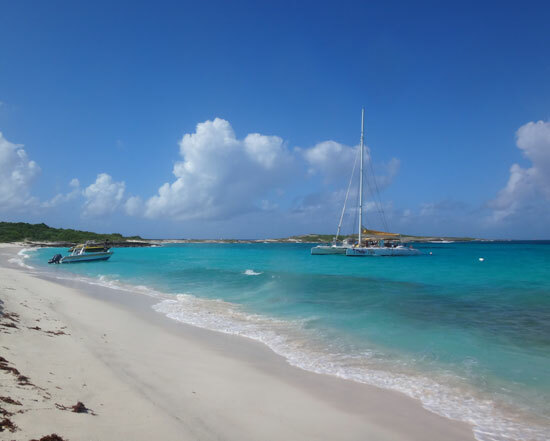 There are also Anguilla and St. Martin charter boats that may arrange for lunch and time spent at Johnno's Prickly Pear, so your options are varied for how you can experience it. Any route will be more smooth if you make reservations in advance. 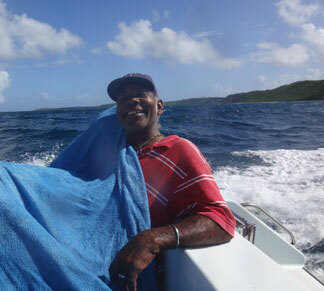 If you are based in Anguilla, I recommend riding out with the man himself, Johnno! To make a reservation with Johnno's call 264-497-2728.